Based on state-of-the-art TT designs, each package includes a cost-effective combination of our products and services. SafeTTy Solutions Packages (SSPs) include an appropriate ReliabiliTTy® licence. We provide further information about SSPs on this page. We also offer a SafeTTy Outsource™ service, through which we perform some or all of the software development activity for our customer. Many of our customers purchase a ReliabiliTTy Technology Evaluation Licence (RTEL) package as a means of exploring our technology and developing their first TT design. What’s included in a SafeTTy Solutions Package? All SafeTTy Solutions packages include a ReliabiliTTy® Technology Licence (RTL). We provide advanced CorrelaTTor® or DuplicaTTor® code frameworks in many SafeTTy Solutions packages. The combination of an advanced, comprehensively-documented code framework and highly-experienced support (provided by our team) can significantly reduce the development effort – and time – required to create a reliable TT design – and achieve compliance with international safety standards. If your team has not previously built a TT design, we recommend that they start their first project with a brief period of training (typically 3 days). After this, we can provide support – as required – to ensure that the project progresses smoothly. We can help you to have your product ‘qualified’ by third-part organisations where this is required. Please contact us for further information about third-part assessments. We offer SafeTTy Solutions Packages in three levels: RTL0, RTL2 and RTL 4. We provide further information about these different categories in the sections below. 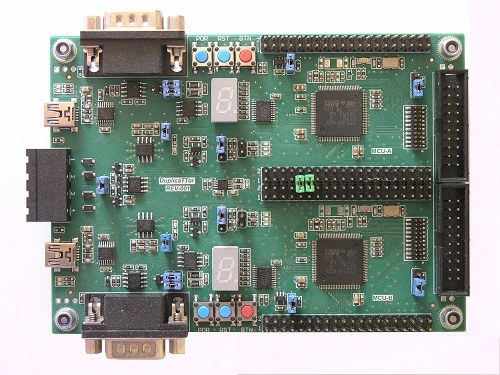 The majority of the design examples presented on this website involve the development of safety-related and safety-critical embedded systems. Some projects that we support are not safety related, but system reliability remains a key design consideration. Our technology is used (for example) in the space sector, for deep-sea monitoring and for animal tracking; in these systems, there are no direct safety implications, but the cost of system recovery / repair would be prohibitive. In other application areas (for example, sports equipment) there are – again – no safety implications, but our technology is used in order to reduce the risks of reputational (business) damage that would result from a product that fails to operate correctly at all times. In such application areas, use of an RTL0 package can be an appropriate option. 2 copies of the ‘ERES2‘ book. Our total fee for SSP-RTL0-Standard is £10,000*. If required, we can extend the consultancy support at a cost of £1,000* / day. 6 copies of the ‘ERES2‘ book plus 6 printed copies of the training notes. Our total fee for SSP-RTL0-Training is £20,000*. If required, we can extend the consultancy support for a further 6 months (two days per month) for a further £10,000*. Our total fee for SSP-RTL2-Standard is £35,000*. Our total fee for SSP-RTL2-CorrelaTTor is £55,000*. 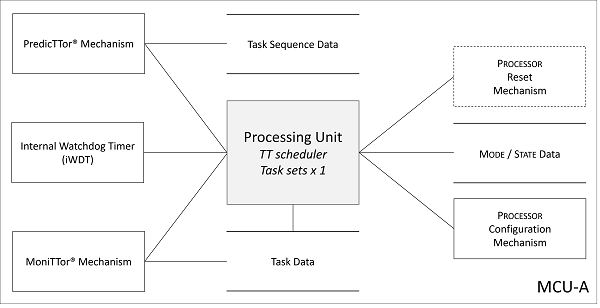 SSP-RTL2-CorrelaTTor includes a complete CorrelaTTor (TT) code framework that can be readily adapted to meet the precise needs of your application. SSP-RTL2-CorrelaTTor is intended to support rapid development of reliable industrial designs in compliance with IEC 61508 (up to ‘SIL 2’); automotive designs in compliance with ISO 26262 (up to ‘ASIL B’); machinery designs in compliance with ISO 13849 (up to Pl d); household goods in compliance with IEC 60730 / IEC 60335 (up to Class B); and medical equipment in compliance with IEC 62304 (up to Class B). The CorrelaTTor code platform is shown schematically below and is described in the ‘ERES2 book‘. NXP® S32K144 (to meet ISO 26262, to ‘ASIL B’). Please contact us for further information about this code framework. Please contact us to discuss support for different hardware targets. Our total fee for SSP-RTL4-Standard is £55,000*. Our total fee for SSP-RTL4-DuplicaTTor is £80,000*. SSP-RTL4-DuplicaTTor includes a complete ‘DuplicaTTor’ (TT) code platform that can be readily adapted to meet the precise needs of your application. 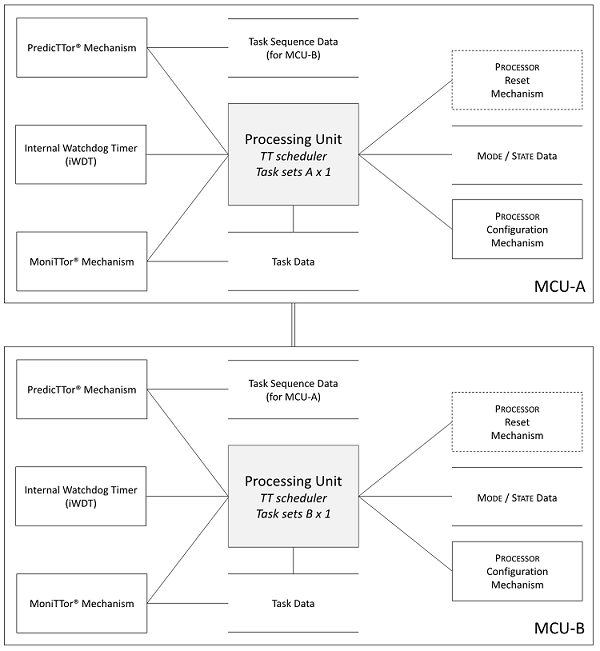 SSP-RTL4-DuplicaTTor is intended to support rapid development of reliable industrial designs in compliance with IEC 61508 (up to ‘SIL 3’); automotive designs in compliance with ISO 26262 (up to ‘ASIL D’); machinery designs in compliance with ISO 13849 (up to Pl e Cat 4); household goods in compliance with IEC 60730 IEC 60335 (up to ‘Class C’); and medical equipment in compliance with IEC 62304 (up to ‘Class C’). The DuplicaTTor code platform is shown schematically below and is described in the ‘ERES2 book‘. NXP® S32K144 x 2 (to meet ISO 26262, to ‘ASIL D’). This page provides some examples of SafeTTy Solution Packages. Every project is different. We can provide fully customised packages on request (to match your precise requirements). All prices quoted on this page are in UK Pounds. Fees and charges may be subject to VAT, depending on your location. Quoted package fees may be subject to an additional charge to cover travel costs / travel time / accommodation costs (depending on your location). This page simply summarises some of our available packages: a formal quotation will be provided. Please contact us for further information about SafeTTy Solutions Packages.